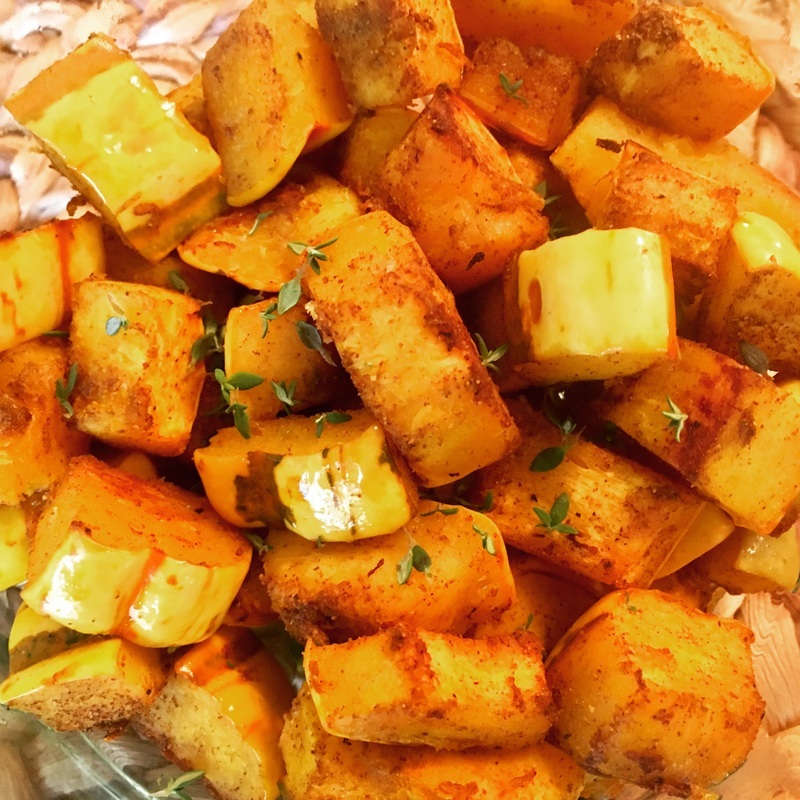 These delicata squash are seasoned with turmeric, cinnamon and ginger, three spices that contain a high concentration of phytochemicals that work at the cellular level to prevent and reverse inflammation in the body. The flesh of the squash is high in beta carotene another powerful antioxidant. Inflammation is the root cause of all chronic illness and fighting it can be as simple as serving a delicious winter squash seasoned with familiar spices. Preheat the oven to 350 degrees. Cut the squash down the long side in half. Scoop out the seeds with a spoon. Dice the squah into about one inch cubes. Place the pieces in the mixing bowl and add the remaining ingredents except the thyme. Toss the squash in the seasoning until evenly coated. Transfer to the baking sheet lined with a silicone mat. Cover with tin foil and bake for 30 minutes or until the squash is fork tender. Garnish with fresh thyme leaves and serve.